Need a stylish new design for your Ghost blog? Looking for something that puts your content first, with an emphasis on reducing eye strain? 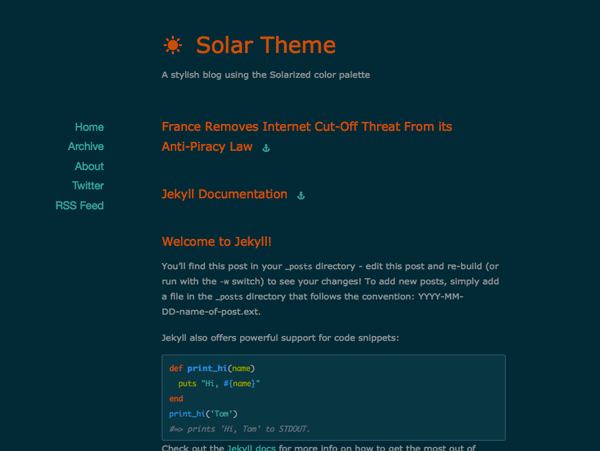 Allow me to introduce my new theme (which is technically a port of the one I made for Jekyll), based on the Solarized color palette. 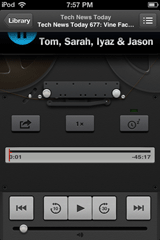 It includes stylesheets for the default light-on-dark version, and for the alternate dark-on-light one. Upload the solar directory to your Ghost blog’s content/themes folder. Go to the Settings page of the Ghost backend and select solar from the Theme dropdown. Save the settings. Be sure to edit the default.hbs template to add or remove any links you want in the navigation list. You’ll probably want to insert the link to your own Twitter profile instead of leaving it as mine, and maybe add your other social networking profiles. LESS has been a popular way to streamline your CSS-writing for a while now, but fitting it into your workflow isn’t always easy. Some designers use standalone applications like CodeKit or SimpLESS to compile their LESS files into browser-ready CSS, but I prefer a more integrated approach. Fortunately, Sublime Text—my personal favorite text editor has several available extensions to build LESS support in. Responsiveness is clearly the future of web design, but one little problem with is advertisements. Ad networks, Google AdSense includes, don’t take kindly to you simply hiding them at lower resolutions with display: none and calling it a day, since the ads still load and register as being displayed. You need to do something smarter. You can see how to do it in the Labnol post How to Use Google AdSense Ads on your Responsive Website. For the uninitiated, straight quotes are a relic from the old days of mechanical typewriters. Rather than have separate keys for the opening and closing marks, they instead used a single key that functioned as both. 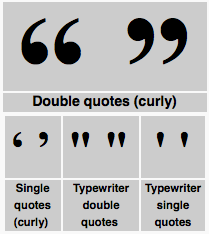 The single-quote glyph also sometimes served as half of an exclamation point on some models, which would be produced by pressing the backspace key and typing the single-quote over a period. History lesson aside, what can we do about Jekyll’s carefree attitude about quotation marks? We could type them manually, memorizing our preferred operating systems’ keyboard sequence to produce proper quotes. But that’s not much of a solution, is it? Shouldn’t a blog engine designed to wrangle Markdown into HTML automatically replace straight quotes for us? I have good news: it can do just that, and it’s a simple matter of editing the _config.yml file. First, you need to install RDiscount. This switches the Markdown parser to RDiscount and enables the “smart” extension, which should enable smart quotes in your post content. Yay! With that change in place, you should get your proper typography in your post titles as well. It’s been ten years since CSS Zen Garden launched with its goal to excite and inspire people to build creative designs with the much more limited tools CSS offered at the time. A decade later, it’s back. Given how the CSS landscape has changed since the original CSS Zen Garden, it will be interesting to see what people create with the new requirements. It’s weird. Practically overnight, several major blogs rolled out similar redesigns that follow this emerging trend that Usability Post has documented. 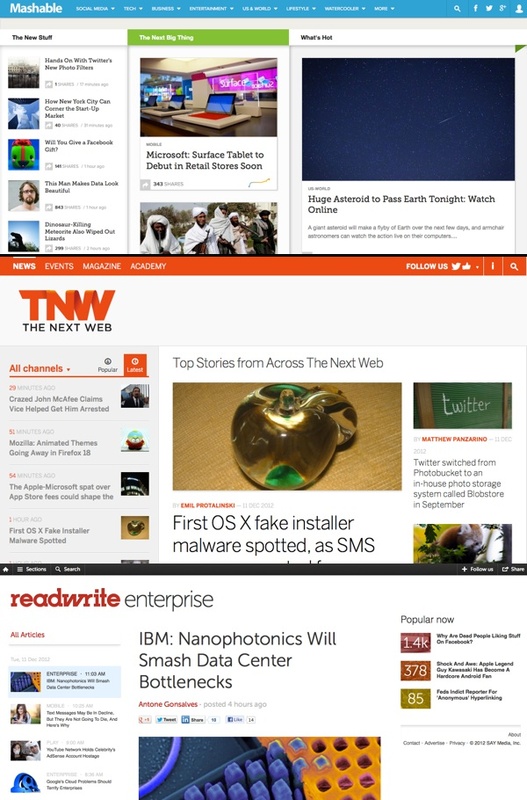 Suddenly, Mashable, The Next Web and ReadWriteWeb all have new designs that feature prominent top bars (which are primarily statically positioned), responsive designs that fill the viewport, flat colors, big image, and annoying columns that scroll independently from the rest of the page. In my opinion, The Next Web’s is the best, pairing polished visuals with a sense of restraint when it comes to the aforementioned sticky columns. And Mashable’s redesign is certainly an improvement over their last one. I’m not normally one to agree with Jakob Nielsen, but he really hit the nail on the head with his fresh rant panning Windows 8. He has seven main complaints, from the “double desktop” inconsistency and low information density to the overly flat UI making it difficult to determine what is and isn’t an interactive element. I’ve long thought that the split between the Desktop and Metro UIs would confuse newbies, though perhaps not so badly as the ARM/x86 issue. A lot of the people who ran out and bought the Surface tablet will probably be irritated when they learn that their x86 software won’t run on it, since the binaries are incompatible with the ARM architecture.